First off Santa we need to apologize to you for being late with our thank you letter. Grandma has taught us better but with all the toys you gave us and the warmer than normal weather well we were playing instead of being responsible. We want to thank you for all the wonderful gifts you gave us again this year!! Without Mrs. Claus, your wonderful Elves and of course you, it would have just been another day at the rescue, but because of your generosity we had a wonderful Christmas!! Some of the Danes here have never experienced Christmas presents before so this was a very special day for them. Many of the Danes did not believe in you Santa, many thought we were lying to them to get their hopes built up, you know, like their owners did when they told them they would keep them safe and forever, but you showed them! We wish more of us could have found forever homes but we do understand that finding the right home is difficult sometimes, and yes we would prefer to wait for the right home rather than to end up homeless again. Again this year we thought we would be lucky to receive 1 gift each but instead we again received several each and plus tons of Christmas cookies and chews. We know that you realize that some of us have enjoyed your Christmas gifts here at the Rescue for several years now and we know that the Rescue will be the forever home for some of us. But because of you, we all do believe that dreams can come true. 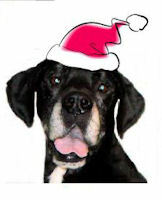 You made this Christmas so special for all of us homeless dogs at the Rescue!! We greatly appreciate all you have done for us again this year. Santa please let all the wonderful people that donated to help the Rescue throughout the year and this holiday season know how much we appreciate them as well. Without their generosity the Rescue would not have been able to afford to save many of us. We don't want anyone to think we do not appreciate what they do for us, because without them, there would be no Rescue to have saved us and the many dogs to come in 2016.